Homemade ravioli (made with your homemade pasta dough) is well worth the time it takes to assemble. The filling always taste much fresher than any commercial product, and you can customize them to your personal preferences. If you have a few hours to invest, I highly suggest making a large batch for freezing: they make supper quick meals for the future, since they are fully cooked in just a few minutes, less time than spaghetti. After you’ve made your pasta dough and it’s resting in the fridge, make your filling. Start with the duxelles (a mixture of finely chopped mushrooms, onions, and herbs) by finely chopping 2 pounds of mushrooms, 1/2 an onion, and a few cloves of garlic. I used the food processor, and chop each vegetable separately. Cook the finely chopped vegetables in a pot, along with a heavy pinch of salt, and 1 Tbsp of fresh thyme. The point is to gently cook off as much liquid as possible, so cook it over low heat until very little moisture is left. While the duxelles is cooking, drain 2 cups of ricotta in a colander lined with cheese cloth, cloth diapers (I highly recommend buying some for exclusive kitchen usage), or a few layers of paper towels. You want to remove the excess liquid from the ricotta, so your filling won’t be too wet. Mix the drained ricotta and cooled duxelles in a large bowl, and set aside while you roll out your pasta into long, even sheets. Once the pasta sheets are ready, put a scoop of filling just off-center of the pasta sheet every few inches. Determine the amount of filling and spacing based on the size of your pasta sheets, and don’t worry if they aren’t consistent. Whisk 1 egg with 1 Tbsp water in a bowl, and use a pastry brush to brush the egg-wash along the outer edges of one side of the un-folded ravioli. Now you can either cut out each ravioli, then apply egg-wash and fold, or cut the ravioli apart after you’ve folded them. It’s really up to you, and depends on how you want to work. The primary thing to be aware of is that the egg-wash makes the pasta dough very very stick, so apply very little of it, and be careful not to stick the pasta to your hands. Also be careful to prevent air bubbles in your ravioli, as these will cause unfortunate ravioli blow-outs. When your ravioli is ready, you can freeze the extra on a sheet tray, then dump them into a bag when they are ravioli ice-cubes. For those raviolis you’re going to eat right away, bring a pot of salted water to a boil. Slice the caps of 1 cup mushrooms; I used plain brown mushrooms, but use whatever you like best. 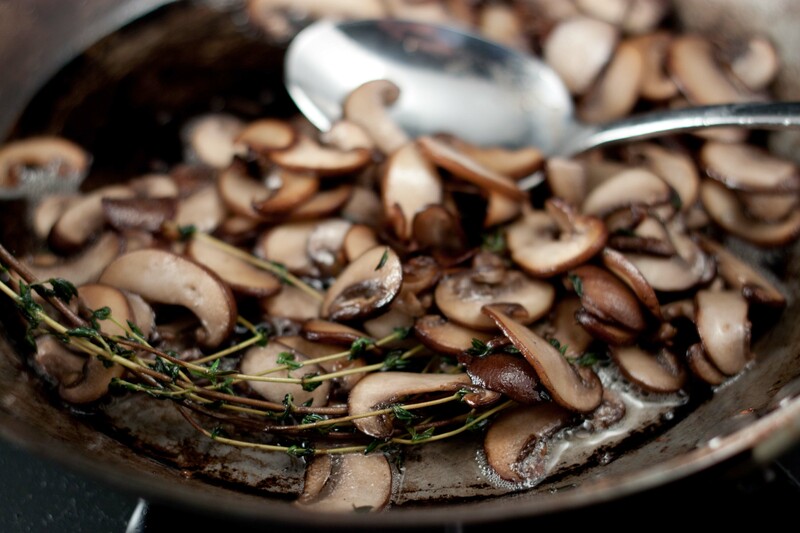 Put a pan over medium heat and dump the mushroom in, along with a pinch of salt. Cook the mushrooms until they start to give up a lot of their liquid. Remove the excess liquid, add 1 Tbsp butter and some sprigs of thyme, and cook over high heat until the mushrooms start to turn golden brown (not just cooked-mushroom brown). When your water is boiling, throw in some ravioli and cook for a couple minutes. The filling is already cooked, so we only need to cook the pasta and warm the filling. When the ravioli are cooked, remove from the water with a spider strainer, and drain in a colander. 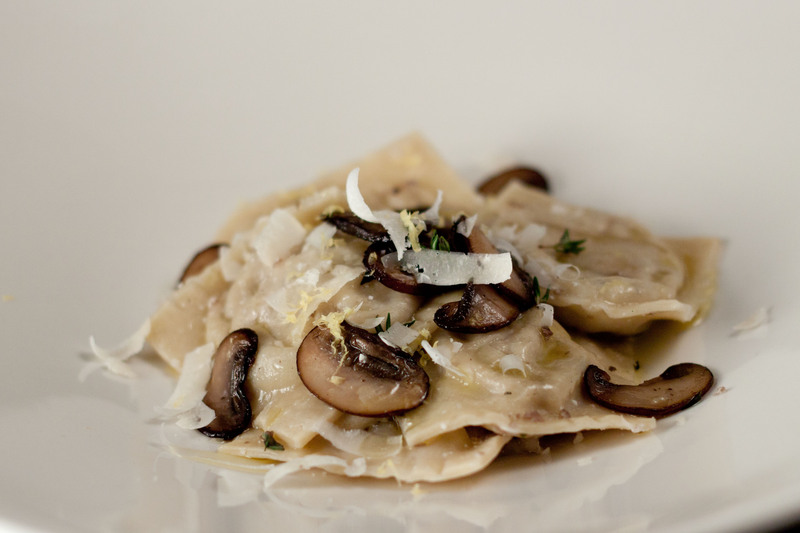 The finish the dish, move your ravioli to a warm plate, drizzle your favorite olive oil on top, and add some golden-brown mushroom slices. I also like to shave some parmesan cheese over it, along with a sprinkle of fresh thyme leaves and lemon zest, to brighten the flavors of the earthy mushrooms. Looks and sounds yummy. Yep, going to have to invest the time to make. Good luck! I highly recommend a ravioli mold. Doing them by hand takes a really long time. Let me know how they come out! I’ve always been afraid to make pasta, but these sound amazing. It may be time to try to conquer my fear-these look worth it. Thanks for the push. You’re very welcome! Good luck, and let us know how they turn out.